Sabre Stats: Stanley Cup hangover? You’re Alexander Ovechkin. You have finally won a Stanley Cup, and partied like it was your last chance at glory. But it wasn’t your last chance. There’s a next year to think about. How have teams done the year after winning a Cup? The short answer, naturally, is that it depends on the team. Some squads are more confident a year later, and enjoy an even better regular season than the one in their Cup-winning season. Some get tired from playing so many games and having a short offseason to recover, and lose a step. We have plenty of evidence to examine on the subject of the play of defending Stanley Cup champions. Let’s take a look at the last 20 Cup winners, and how they did a year later. The chart below refers to year-to-year winning percentages, the change over that period of time, and what happened to them in the playoffs of the second year. First off, it’s obviously tough to repeat. Only two teams did so – Detroit and Pittsburgh. But only three other teams made it back to the final the next year. In other words, five of the last 20 Cup champions have made it back to the final a year later. And three more made it to the conference final, so that statistically the Caps would seem to have a less than even chance of getting through the first two rounds in 2019. Meanwhile, three of the teams lost in the second round, seven dropped out in the first round, and two missed the playoffs completely. That’s probably less success that most would have predicted. Only six teams improved on their regular season records the season after winning a championship. It’s interesting that two of them – were the only ones to repeat, and a third lost in the final. 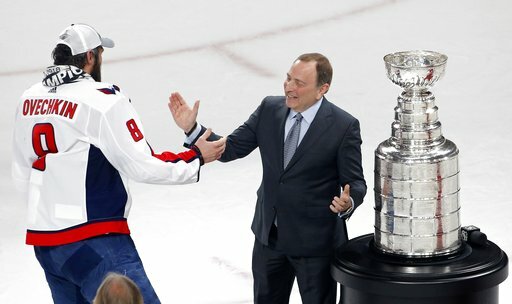 If the Caps have designs on winning a second Cup, a good regular season starting this fall would be a good way of getting there. The average Stanley Cup champion has seen a drop in winning percentage the next season of about .040, or four percent. Carolina fell from .683 to .537, the second-largest decline in winning percentage. Only Chicago in 2013 to 2014 was bigger, and the Blackhawks piled up an .802 number in a lockout-shortened season in 2013. Chicago wasn’t going to keep that up for a full 82 games. One last point – only four teams of the 20 had winning percentages above .700 in their Cup-capturing season. Only Detroit (2008-09) even made it back to the Final a year later.